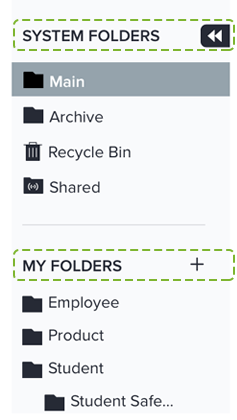 Folders are a great way to keep your surveys organized. SoGoSurvey starts the organization for you, but only you know the system that will work best for you! By default, your account has four System-defined folders (Main, Archive, Recycle Bin, Shared) that are designed around functionality. 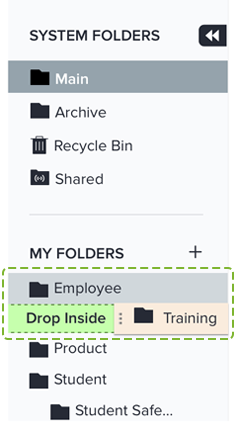 Additionally, you may create user-defined folders, which will be displayed under the ‘My Folders’ section on the left-hand side of the screen. From any tab, folders can be located on the left-hand side of the screen. From any tab, click on the + next to MY FOLDERS. Click the check to Save. Up to 20 folders can be added to your account. 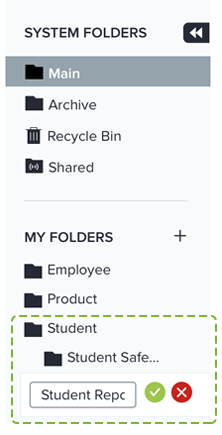 Account sub-users cannot add folders. From any tab, navigate to MY FOLDERS and hover over your chosen folder. 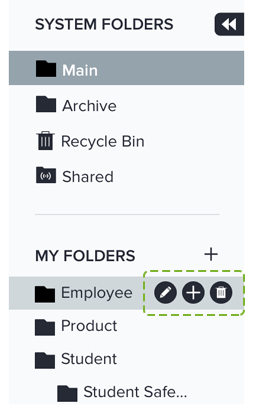 Click on the + icon to the right of the folder name. Enter the name of the new sub-folder. From any tab, navigate to MY FOLDERS and hover over any folder. You can only delete an empty folder. If the folder you try to delete is not empty, you will be notified. You can rearrange folders by dragging and dropping them into your preferred order.